If you want the shortest possible introduction to Pollen, try the Quick tour. I’m going to assume that you’ve already installed Racket and Pollen. If not, do that now. I’m also going to assume you know the basics of using a command line to run programs and navigate your file system using commands like cd and ls. As I mentioned in the The big picture, Pollen is built using Racket, and everything in Pollen ultimately becomes Racket code. If you’re comfortable with that idea, you may move along. One of the key features of Racket as a programming language is that it provides tools to create other programming languages. These languages might look & behave like Racket. Or they might not. These languages might serve a general purpose, but more often they’re specialized for a particular purpose, in which case they’re known as domain-specific languages, or DSLs. If you find this a strange idea, you’re not alone. Most programmers — and until recently, me too — have never made or used DSLs. If you have a programming problem to solve, you start with a general-purpose language like Python or Java or Ruby, and go from there. Nothing wrong with that. But programming languages contain their own design choices and compromises. Sometimes the problem at hand is best solved by manipulating the language at a deeper level. When you make a DSL, you’re still programming in the underlying language, but doing so at a point of higher leverage. Pollen is a DSL implemented in Racket. It is a close cousin of Scribble: The Racket Documentation Tool, another Racket DSL, which was designed for writing Racket documentation. The key feature of Scribble, and thus also of Pollen, is that it’s text-based. Meaning, whereas most languages have source files made of code with text embedded within, Pollen’s source files are text with code embedded within. As you work with Pollen, you’ll become familiar with how Pollen corresponds to Racket, and easily be able to convert commands from one notation to the other. In later tutorials, you’ll see how larger Pollen projects can be assembled out of a mix of Pollen and Racket source files. But in smaller projects, like this one, you can just use Pollen. DrRacket is the IDE for the Racket programming language, and other languages made with Racket (like Pollen). IDE stands for “Integrated Development Environment,” which is a fancy phrase for “a nice place to edit and run your code.” DrRacket is installed as part of the core Racket distribution. Experienced programmers may prefer to use a general-purpose text editor and the command line to edit and run Racket programs. That’s fine. But for these tutorials, I’ll assume you’re using DrRacket. Otherwise, I trust you to figure out what you need to do to keep up. Welcome to DrRacket, version 7.2--2015-11-26(-/f) [3m]. Language: racket; memory limit: 1000 MB. If you don’t see the interactions window, select View|Show Interactions from the menu. The first line of every Racket source file, and every Pollen source file, is called the #lang line. The #lang line identifies the language used to interpret the rest of the file. For more about the #lang line, see Defining new #lang Languages. BTW, #lang is pronounced hash-lang. Language: pollen; memory limit: 1000 MB. Why? Because there’s no language called pollenxyz. Switch it back to pollen and let’s move on. 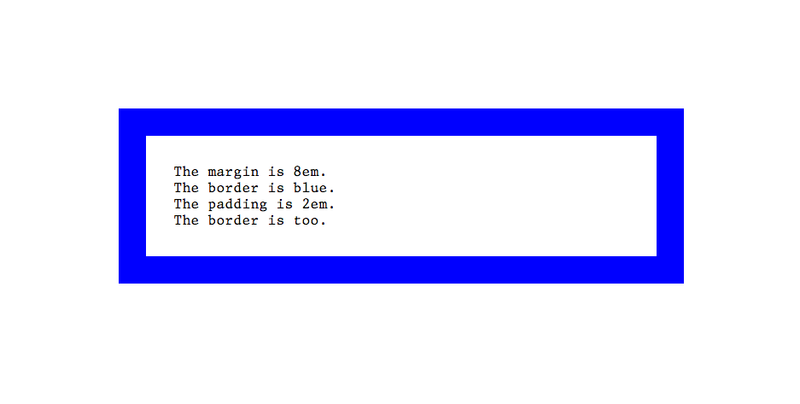 Here’s a short, bad poem I wrote about CSS. This shows you something important: by default, any plain text in a Pollen source file is simply printed as written when you Run the file (minus the #lang line, which is just for Racket’s benefit). If you like, edit the text of the poem and click Run again. You’ll see the updated text printed in the interactions window. Don’t skip this section! It explains an essential Pollen concept. File naming in Pollen is consequential. Ultimately, every Pollen source file in your project will be rendered into an output file. Each Pollen source file corresponds to one output file. The name of this output file will be the name of the source file minus the Pollen source extension. So a source file called "file.txt.pp" will become "file.txt"; "index.html.pp" will become "index.html". Append the appropriate Pollen file extension. Different Pollen source files use different extensions — but more about that later. For now, the extension you’ll use for your source is ".pp". + the source extension ".pp"
In the rest of this tutorial, if you want to name the file "something-else.html.pp", be my guest. There’s no special meaning associated with the prefix of a source file. Only the suffix. If your system or text editor gives you grief for having two file extensions, you can alternatively use an underscore character (_) for the inner extension. So instead of "poem.html.pp", your source file would be named "poem_html.pp". This filename will work exactly the same way, and still result in "poem.html" when rendered. In a convenient location (e.g., your home directory or the desktop) create a new directory for your project called tutorial. In this new directory, save your DrRacket file as "poem.html.pp". The project server is a web server built into Pollen. Just as DrRacket lets you run individual files and see if they work as you expect, the project server lets you preview and test your project through a web browser. While working on your Pollen project, you may find it convenient to have DrRacket open on half your screen, and on the other half, a web browser pointing at the project server. “Why can’t I just open the HTML files directly in my browser?” If you want to keep making web pages the way we did in 1996, go ahead. But that approach has several shortcomings. First, when you open files directly in your browser, you’re accessing the local filesystem, and absolute URLs — the kind that start with a / — won’t work. Second, you have to render your HTML files in advance, whereas the project server is clever about doing this dynamically. Third, if you want to test your website on devices other than your own machine — sorry, you can’t. So use the project server. Even if you’re not planning to make web pages with Pollen, web browsers can display all common digital files, so the project server still ends up being a convenient previewing tool. A note about security. The project server isn’t intended for real-world use, but rather as a development tool. That said, once you start the project server, it’s an actual web server running on your machine, and it will respond to requests from any computer. If you want to limit traffic to your local network, or certain machines on your local network, it’s your job — not mine — to configure your firewall or other network security measures accordingly. Before we start the project server, a word about the raco pollen command. Project root means the directory that the project server was started in, and which the server will regard as its root directory. Meaning, absolute URLs (i.e., those beginning with /) will resolve into this directory. So a URL like /styles.css will impliedly become /path/to/tutorial/styles.css. The next line of the startup message tells you that the web address of the project server is http://localhost:8080. This is the address you’ll put into your web browser to test your project. If you’re unfamiliar with this style of URL, localhost refers to your own machine, and 8080 is the network port where the project server will respond to browser requests. If you want to run the project server on one machine and access it from a different machine (say, for testing purposes), you can’t use localhost. But you can use the IP address of the machine running the project server (e.g., http://192.168.1.10:8080) or any name for that machine available through local DNS (e.g., http://my-laptop:8080). You can also change default port for the project server by overriding default-project-server-port, or parameterizing it with current-server-port. You can also run multiple project servers simultaneously — just start them on different ports so they don’t conflict with each other. Your terminal window will report status and error messages from the project server as it runs. Use ctrl+C to stop the server. For each directory in your project, starting at the top, the project server displays a dashboard in your web browser. The dashboard gives you an overview of the files in the directory, and links to view them. The dashboard is deliberately not at http://localhost:8080/ or its equivalent, http://localhost:8080/index.html. Why? So it doesn’t interfere with any index.html that you may want to have in your project. Thus, the dashboard relies on a different file, called "index.ptree". The ".ptree" extension is short for pagetree. In Pollen, a pagetree is a hierarchical list of pages. We’ll do more with pagetrees in a later tutorial. For now, just be aware that to create a list of files for the dashboard, the project server will first look for an actual "index.ptree" file in each directory. If it doesn’t find one, it will generate a pagetree from a listing of files in the directory. Then, in your web browser, visit http://localhost:8080/index.ptree. The top line tells us that we’re in the root directory of the project. We didn’t make an explicit "index.ptree" file, so the project server just shows us a directory listing. The margin is 42em. The border is red. The padding is 15em. The border is too. Granted, this is a boring web page. The main point here is that you’re seeing the output from your source file, which didn’t exist before. Notice that the address bar says http://localhost:8080/poem.html, not poem.html.pp. And if you look in your tutorial directory, you’ll see a new file called "poem.html". In other words, when you clicked on the filename link in the dashboard, Pollen rendered the output file from your source file and saved it in your project directory. As promised earlier, the name of the output file ("poem.html") is the name of the source file ("poem.html.pp") minus the Pollen extension (".pp"). If you go back to the dashboard and click on the filename link again, you’ll see the same output file. If the source file hasn’t changed, Pollen will just show you the output file that’s already been rendered. The cave is pitch black. Look out for the grue. The cave is pitch black. Look out for the grue. The padding is 15em. The border is too. Here, Pollen notices that the source file has changed, so it refreshes the output file. This makes it convenient to work between DrRacket and your web browser, editing source and then reloading to see the changes. The other two links in the dashboard are labeled in and out. For now, the files are identical except for the #lang line. But let’s change that. Pollen can operate in several modes. One of these is preprocessor mode. A preprocessor is a tool for making systematic, automated changes to a file, often in contemplation of further processing (hence the pre-). You can use the Pollen preprocessor this way — as the first step in a processing pipeline. Or you can just use it on its own, and leave your files in a finished state. That’s how we’ll use it now. 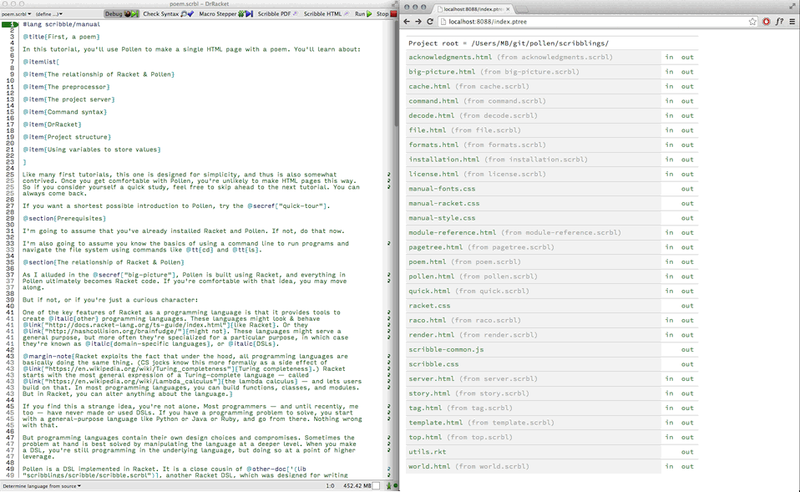 We’ll build out our "poem.html.pp" source file so that when it exits the preprocessor, we’ll have a legit HTML file. For more about the Pollen processing modes, see File. Insert #lang pollen as the first line. Add the ".pp" file extension. “I can use the preprocessor with any kind of text-based file?” Right. “But how?” The preprocessor reads the file, handles any Pollen commands it finds, and lets the rest of the content pass through untouched. To the preprocessor, it’s all just text data. It doesn’t care whether that text represents HTML, CSS, XML, LaTeX, or even TI-BASIC. This file has #lang pollen as the first line, and ".pp" as the file extension. So yes — it meets the minimum requirements for the preprocessor. As before, because the source has changed, Pollen refreshes the output file. From the dashboard, you can use the in and out links to inspect the source and output. This is now a valid HTML page. I mentioned that the preprocessor reads the file and handles any Pollen commands it finds. But our source file doesn’t have any yet. Let’s add some. Pollen commands in your source file can be written one of two ways: Pollen style or Racket style. We’ll try Pollen-style commands in the next tutorial. For now, we’ll use Racket style. If you’re using more complicated data types, or you don’t like the preprocessor’s automatic conversion, you can convert your values to text by hand. Pollen will try to fulfill your request, but weird things could happen. And the result definitely won’t be valid HTML, because you can’t simply drop binary data in the middle of an HTML file. As Mr. Babbage warned — garbage in, garbage out. The core building block of Racket is the expression. An expression can be a single value (like 2 or "blue"), a variable (like edge), a list of values (like (list 2 "blue" edge)), or a function call. Function calls go between parentheses. Unlike most languages, the function name comes first, followed by its arguments (so it’s (* inside 4), not (inside * 4)). This is called prefix notation. Every expression is evaluated to produce a value. A variable evaluates to whatever value it holds (so after we say (define inside 2), inside would evaluate to 2). A function call evaluates to its return value (so (+ 2 2) would evaluate to 4). Expressions can contain recursively nested expressions. Thus, (* inside 4) could be written (* inside (+ 2 2)) or (* inside (+ (+ 1 1) (+ 1 1))). Newcomers to Racket often gripe about prefix notation and parentheses. If you need to get it out of your system, go ahead. Keep in mind, however, that it’s not some peculiar affectation, but rather a necessary consequence of rule #1. In time, you’ll agree that the benefits outweigh the costs. ◊; create a variable `color` that holds the value "blue"
To learn more about Racket syntax, consider a detour through the excellent Quick: An Introduction to Racket with Pictures. What’s with the blank lines? Don’t panic — a ◊(define ...) command creates a variable, but the command itself doesn’t evaluate to any value. So instead, we get blank lines. (Don’t panic about that either — define is an exception to the general rule that all expressions evaluate.) So far, so good. Hey, look at that — the text of the poem changed. Now it even rhymes. If you like, in the source file, edit the variable definitions with different values and reload the page in the project server. The page will be rendered afresh with the new values. In particular, if you update inside, you’ll also see edge change, since its value depends on inside. Pro tip: when inserting a variable as a value, you can also just type ◊variable-name. The vertical bars on the sides are never wrong, but only mandatory when you want the value to appear flush against other text on the right. Our poem now makes claims about the margin, border, and padding of the page that aren’t yet true. To fix this, we’ll rely on the same basic technique of inserting variables into our HTML file. But instead of putting them in the <body> of the page, we’ll put them in a CSS <style> tag. Notice that we’re using the same ◊|variable-name| pattern as before to insert the variable values. What do we expect to see? We expect that the padding and border will be 2em wide, because inside is 2. We expect the margin to be 8em, because it’s equal to edge, which is inside multiplied by 4. And we expect the color of the border to be "blue", because that’s the value of the variable color. As before, if you edit the values of the variables in the source file and go back to the project server, you’ll see both the text and the layout change. This was a sneaky tutorial. Though the HTML page we made was very simple, we saw all the key elements of the Pollen development environment, and learned about the preprocessor. Feel free to go back and experiment with what you’ve learned. The next tutorial will assume that you’re comfortable with all the material here.